A majority of the annual cranberry crop is processed into concentrate that is then made into juice or juice blends. To keep things simple lets just say concentrate is the most economical way of storing cranberry juice. Basically the water is taken out which makes shipping cranberry juices as well as storing product much more efficient. There are different concentrations of concentrate. Depending on how much water a customer wants out of the cranberries. The process of taking water out at certain levels gives the concentrate a numeric value. For instance single strength (basically fresh squeezed) has a brix designation of 7. The more concentrated the juice the higher the brix number will go. Generally speaking 50 brix concentrate is the industry standard. Internationally some companies will request as high as a 65 brix. In some instances the concentrate is made directly into cranberry juice products using single strength which often garnishes the designation as being (not from concentrate.) If you read bottles in stores of all forms of fruit juices, orange cranberry apple etc., some will say (not from concentrate.) When this is on the label that is what they are referring to. As far as concentrate is concerned most buyers will request a sample of the product to have tested at his or her own facility or private lab. This is only a very general overview. A growing percentage of the cranberry crop is being made into a product called Sweetened dried cranberries. Basically picture in your minds eye a raison or prune. Most Sweetened dried cranberries are void of a lot of their water content and usually are later infused with different sweeteners or ingredients, depending on customer preferences and or requirements. You may be familiar with the name Craisons, which is a patented name, used exclusively by the Ocean Spray Cooperative. Some of the Sweetened Dried Cranberries are coated with different ingredients such as Chocolate etc. Some are infused with other items such as maple syrup. Individual companies that sell the product they produce patent most of the different processes. We do not manufacture this product but may have the ability to have our raw product converted as a value-added procedure. The largest portion of the cranberry crop is sold to most industrial buyers in this initial basic form. Cranberries are harvested, brought to cleaning facilities and put into individual storage containers. There are numerous forms of containment from cardboard to plastic to wooden crates with or without plastic liners. There are a lot of preferences that can be accommodated for depending on the type of Whole frozen Cranberries desired. Basic frozen, whole cranberries are binned right after being cleaned and sorted. Most of the water has been taken back off the berries. This type of fruit usually is destined to become cranberry concentrate by most manufacturers. Another popular form is known as (Free Flowing) whole Frozen Cranberries, which is basically the same as the above, but with far more interest in completely drying the berries. This is for being able to pour or manipulate the cranberries in a frozen form so that they don't all stick together. This requires an additional value added process but also gives the buyer more versatility in the products that the cranberries can be made into in the frozen form. In the categories referred to above there are many sub type categories, depending on size examples are Jumbo, Select, bulk, minnies, etc. Depending on the requirements of the customer. 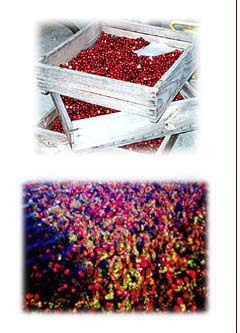 For example those desiring to make Sweetendried would usually prefer large Jumbo cranberries to be separated by a sorter when the berries are being processed. Bakeries usually would prefer small or mini cranberries for muffins etc. The attempt here is to just basically familiarize customers the many forms available in the industry. Our raw cranberries can be converted through the use of value added procedures. Sliced cranberries are basically just what you would expect buy the name. Cranberries usually sliced while frozen. There are also sub-categories of sliced cranberries depending on how thick or thin a customer wants the individual cranberries sliced. Some processes can even go further in sub-catagorization by quartering the berry etc. Once again the name describes itself. Fresh cranberries that can be acquired with ANY requirements desired. Most are sold as a bulk type product. Fresh can be sorted to different specifications such as color, size, even variety if desired. Some varieties have a longer shelf life than others. Fresh cranberries are usually treated different when grown for adding to shelf life. Most Fresh fruit is only available for certain seasonal periods of time. Fresh fruit could be frozen for longer storage intervals. At that point the product would essentially be called fresh frozen. There are many new and old sub-categories that combined make up a minimal amount of the cranberry category. Seeds, Cranberry puree, cranberry puree concentrate, powdered cranberry, sauce, jams, jellies etc. There are so many uses that the fruit can be used for using ones imagination. If you have a product idea or suggestion we are anxious to hear your ideas.